Valerie Knopik, PhD, is the Director of Research for Yoga Medicine, a Senior Research Scientist & Professor of Psychiatry and Human Behavior at Brown University, and a yoga teacher in Providence, Rhode Island. 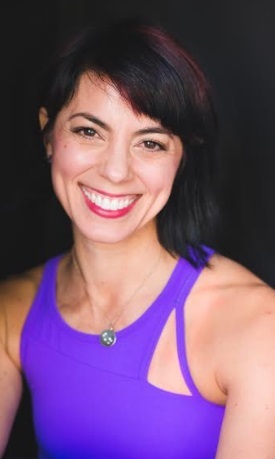 Formally trained in classical ballet, as well as a former runner, Valerie has always been a believer in staying active but yoga is the perfect marriage of her work in mental health & her love of movement & anatomy. With a PhD in Psychology, Valerie is extremely active in mental health research, focusing on how our internal biology and our external physical environment (including yoga, mindfulness, and meditation) can interact to positively change our mental health landscape. 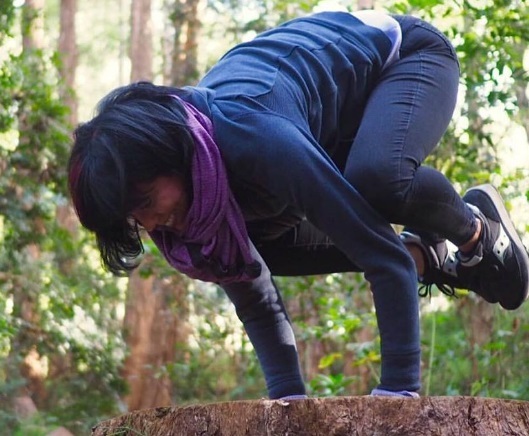 Valerie’s sincere hope is that, while the physical asana practice might be the introduction to yoga (as it was for her), her students can utilize the asanas as a tool to find cohesion of body, mind, and spirit in order to experience fullness & purpose in their lives. Valerie lives with her husband and their two children (and a big, loveable Great Dane named Justice) in RI. If I had to pick one phrase to capture what I do best, it would be the following: I inspire others to pursue and achieve their true potential. I wear multiple professional hats – one as an academic researcher/scientist mentoring postdoctoral fellows and junior faculty at Brown University, one as a Yoga Medicine trained teacher holding space and guiding students every week, (as of a few months ago) yet another as the Director of Research for Yoga Medicine. While these professional hats used to feel very separate and distinct from one another, I find that now, more than ever, my experiences in these various domains are mutually informative. I truly believe that this gives me an advantage and allows me to carve out a very specific niche. What I do best boils down to this simple action, informed by all aspects of my life – inspire others to pursue and achieve their true potential, provide them with the tools to dig deep, start from within, and achieve their goals. I am so passionate about my new role as Director of Research for Yoga Medicine because it allows me to draw on every modality of my experience to date. Working alongside Tiffany Cruikshank and the Yoga Medicine team, I am building a research program focused on the application of yoga, meditation, and mindfulness to improve health and the human condition. Our vision is to educate and empower our global communities to use yoga therapeutically based on a deeper understanding through purposeful and well-designed research. Through this effort, I have the honor of mentoring and training our Yoga Medicine community of teachers in the nuances of conducting research and to deliver purpose-driven yoga, meditation and mindfulness instruction as a way to robustly examine its effects on various health outcomes. In my view, this continues the push, already started by Yoga Medicine, to raise the bar on what it means to be yoga teacher. Education. Experience. Results. I teach, mentor, and speak from a genuine and authentic place. That is, I use my own personal journey and experiences – both struggles and successes -- to connect with others and inform my work. I know that not everyone is going to appreciate that and that is okay; but, in working from that authentic place, I have built a community that encourages all to bring their unique gifts to the table and to shine brightly. Moreover, I think that passion and authenticity actually shows – i.e., that it is evident to those around me and they can, in turn, find a safe refuge to learn and grow in that space that I have helped to create. In many ways, my personal and business goals are intertwined. PERSONAL: To love fiercely (family and friends), to support unconditionally, to be passionate about what I do for a living, to be better at creating balance in my own life, to stay grounded through life’s challenges, and to be someone people want to be around. Ultimately, I want to make a difference in people’s lives. BUSINESS: To continue to find ways to combine my two loves/careers – scientific research and yoga – in a way that is meaningful and balanced. To continue to be an outstanding mentor and teacher in all domains of my professional life. To continue to learn and grow by working and training with my own mentors. I feel very fortunate to have worked incredibly hard and to say that I’ve been blessed with many successes. My academic career has had a trajectory that I am very proud of and my path in yoga has, of late, blossomed into more than I could have imagined one year ago. The joining of the two – research and yoga – via my role as Director of Research at Yoga Medicine, is something I dreamed of and something that I proud to say that I am diligently working toward. However, I remain steadfast in saying that my family is my biggest success. My two children and my marriage are the most important work that I do. They are my biggest supporters and cheerleaders and I would not be where I am today without them. They have shaped who I am and my work ethic (and, let’s be honest, having two children has honed my ability to juggle multiple jobs and projects!). There are three incredibly challenging moments that have shaped who I am – (1) the death of my mother when I was 12 years old; (2) the death of my 16-year-old niece; and (3) a 6-month separation from my husband. (1) When I was 12, my mom died of cancer. She was sick on and off for about 3 years before she passed. Having to navigate those waters as a child – well, I can’t say that I did it very well. I did the best that I could and my dad and siblings did the best they could. But how do you survive that grief and that loss? I am still dealing with the aftermath of really having never completely processed many aspects of her death. I still wrestle with feelings of guilt that I didn’t go into her hospital room one last time before she died and the constant wondering of whether or not she would be proud of the person that I have become. But, losing her gave me such gifts…a relationship with my dad that is like no other and the fierce desire to be the best mom I could be (and you can bet that I celebrated inside myself when my children, one by one, turned 12 because I have officially had more time with them than I had with my mom) – and for these gifts, I am so incredibly grateful. (2) Four years ago, my 16-year-old niece, Leanna, fell ill with a rare viral infection of the heart, myocarditis. From the time she fell ill (with what seemed like the flu) to the time that she passed, was a little over one month. ONE MONTH. One month of touch and go. One month of my brother and his wife living in the Ronald MacDonald house at the hospital. One month of ups and downs and gut-wrenching decisions. One month of our family, in various combinations, rallying in that hospital waiting room. It still feels surreal. I wish every day that she was still here with us. Yet, what I take away from this is the lesson in how one person can affect others...how one person can profoundly change another’s perspective on life…and to remember to enjoy each and every moment, because I’ll never get another moment quite like it. (3) My 6-month separation from my husband and our decision to make it work. Five years ago, my husband and I were separated. I will not go into the details but suffice it to say that we lost track of each other. After 11+ years of marriage, we lost each other, plain and simple. During that separation, there were times when I was sure we were going to get a divorce and times when I wondered how our children were going to handle things. I hate that we went through that period. But, I’m so incredibly grateful at the same time. Why? Because we found each other again, in all of our flaws and our individual differences, and we made the joint decision to try to make it work. That period in my life taught me how much effort a successful marriage (or any relationship, really) requires. It is not something to just sit back and watch. You need to be an active participant. You can’t check out. Not for one moment. It also taught me who was truly in my support network. I still can’t believe it, but I lost people who I thought were good solid friends when my husband and I decided to move forward with our marriage. For whatever reason, they couldn’t understand it or chose not to. It taught me who was in my tribe…and those people who stood by me (and by us). I love those people fiercely and always will. My dad, Walter Knopik, for showing me what it means to be a beautiful person, inside and out, and for teaching me the value of hard work. My brothers, Chris Knopik and Steve Knopik and my sister, Barbara Baker for setting the bar and being supportive every step of the way. My dearest and oldest friend, Kristi Garner, for everything. My husband, Scott Kiekbusch, and our children, Violet and Ronin, for holding me accountable everyday and for teaching me how to love deeply and unconditionally. My mentor, Tiffany Cruikshank, for pushing me to be the yoga teacher than I am today, for encouraging me to grow and find my niche, and for giving me the opportunity to join my love of research and my love of yoga in a way that empowers others. My trainees and students, for trusting me and for teaching me. I’ve learned so much from each and every one of them. Yoga, science, research, the beach, the ocean, food, dark chocolate, music, cooking, wine, reading for pleasure (not work), down time, relaxing at home, Sunday afternoons with no obligations, movies, massages, my family – translation??? Anything that fuels me and makes me feel alive!